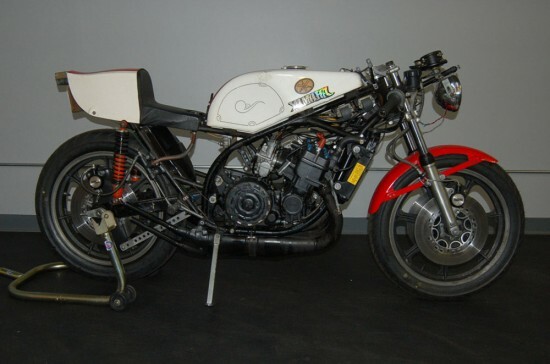 The original bikes actually displaced 700cc’s, exactly like a lashed-up pair of 350 twins might and, although the four used much of what Yamaha had learned racing their 350, it shared no parts with its little brother, and appears to have been based on a bored-out version of their 500GP machine, making it very exotic indeed, although handling on the first bikes was fairly suspect. 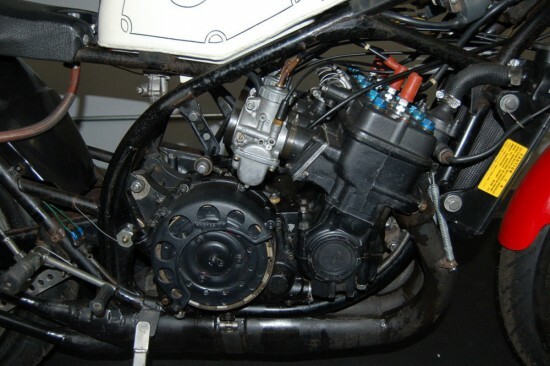 This early example uses a more conventional twin-shock rear suspension: later bikes featured thicker tubing and a much improved monoshock suspension that redirected suspension forces to the steering head and created a much more stable platform for the four-cylinder, two-stroke animal lurking under the bodywork. 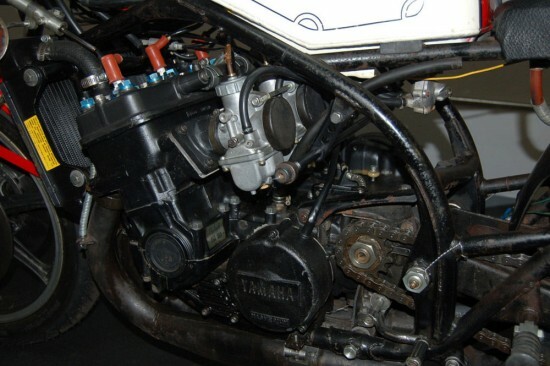 That liquid-cooled lump featured reed-valves for a wider powerband, likely around 90hp here, although later bikes put a slightly terrifying 140hp through the bikes six-speed box. 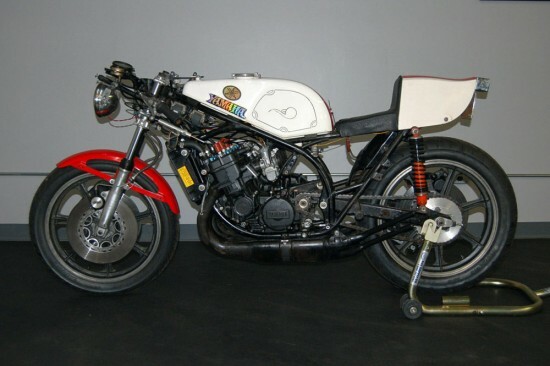 Combined with decent handling from the later monoshock frames, it made the TZ750 the bike to beat during this era. Now I really had to think about how far down do we take this project, we could do a frame off complete restoration or just clean? Well the answer is; They Are Only Original Once! We just cleaned it and got it running. Now the old guy told me that even though it was in storage in his garage that he would once a year spray WD40 in the cylinder and after inspecting the lower end I believe him. We removed the head and cylinders to inspect the lower end, we also scoped as much as we could. The crank looked perfect and clean. So we cleaned the piston rings and wrist pins and put back together. Please note that we have only run this bike a couple of times so we are mixing the fuel very rich, that is why there is so much smoke in the video. Also the video was shot on May 6 of this year and it was the first and only ride on this bike. My tech is the rider and it stalled on his first run because he was trying to find first gear. The video (we will be posting soon) and pics speak for themselves. 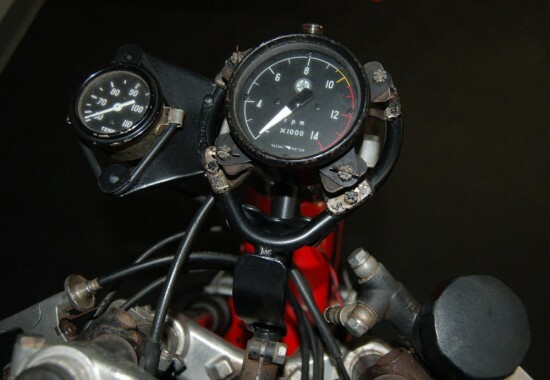 As you review the pictures note that the bike still has most if not all of the original safety wire from its race days. Also note that is bike has most if not all of the original factory cable and hose clips or clamps. These items are usually missing on most of the TZ bikes I have seen. I did not try to mount the fairing as it seemed to fragile from sitting in the garage but is mostly complete. Original paint bike (I would say about 98% original as I did repaint the head, exhaust and some misc bracket). Removed head & cylinders, cleaned rings and wrist pins, scoped and inspected crank. Crank and lower end was perfect. New tires, however they are road tires not track tires. Race fairing with new replacement wind shield (this windscreen will need some alteration however was the only replacement available). And no, your eyes aren’t playing tricks on you: that is a rear-view mirror, tail light, and a headlight on there: one of the previous owners set the up for road use! Kids, don’t try this in California… And yes, although it is a big rough around the edges, it does run, as can be seen in this video here. I love how hard-edged that two-stroke crackle is here, sounding pretty far-removed from the typically agricultural sound of an idling smoker. 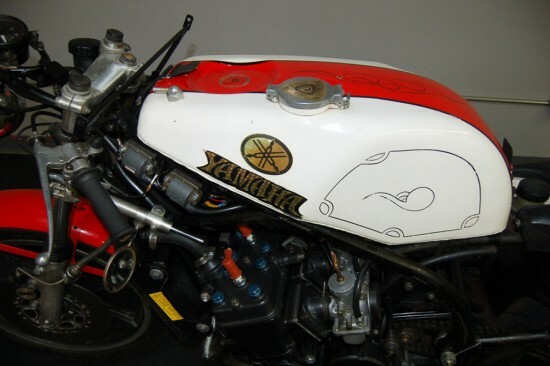 Yamaha RZ500 with California Title! Kenny Roberts said the TZ750 was a terrible handling bike that tried to spit you off at ever turn but he managed to win races by hanging on. It a truly magnificent machine for collectors but not a bike you buy to ride unless you have a death wish. 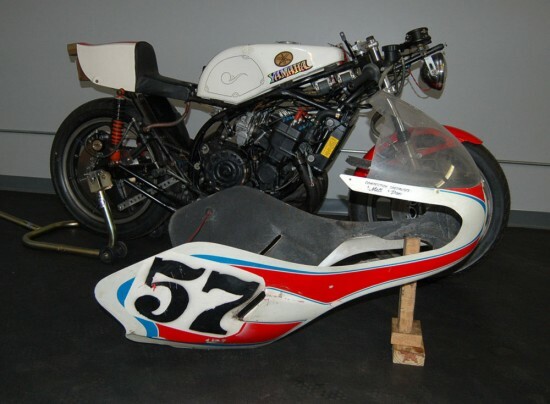 I do believe the TZ-700’s and 750’s were made up of two TZ350’s. The crankshafts of the 350’s were mated through gears. Note the seller said they removed the CYLIINDERS. Regardless, what a find. Those four pipes and open carbs just sound NASTY!